I suspect their ever-evolving style has some times to the group’s history. Back when the band was founded in Tucson, Arizona by singer/guitarist James Arrr, it had around 5-6 members and a constantly changing parade of drummers. This continued into their 2007 debut album In Sickness and In Health and their 2008 Ghouls Among Us EP. 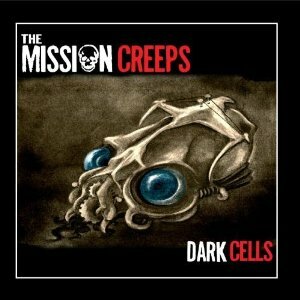 But Dark Cells marks a new direction for the Mission Creeps, as the band has been pared down to three members: The previously-mentioned James Arrr with Miss Frankie Stein on bass and newcomer Jeff DiDay on drums. A heavy medium guitar and drums form the very 60’s-style opening of the first track, “Boneyard Scene.” Things pick up when the singer does, and we get a mix of surf music with blues and other stuff. I especially liked the cool guitar riff used in it. Mr. Arrr has lower voice than most singers on the Surf-ari, which gives things a very effective, serious feel. The best way to summarize this song to anyone who hasn’t heard it is that it’s like something that would play in a chase scene from an impossibly awesome, parallel universe version of Scooby-Doo. “Monster (Massive Return)” has very rocking opening drums and guitar. The lyrics describe a Frankenstein-like stitched and surgically altered person who is unaware of how they’re seen by others. Even if it didn’t have the great (but short-lived) guitar interludes, it would still be incredibly catchy. The guitar and drums work extremely well together and the reverb fade out was an interesting way to close things out. The soft opening guitars of “Dark Cells” are rather slow, but steadily increases in volume while the drums and cymbals are somewhat faster. Soon Arrr sings of isolation and darkness between the instrumental segments and wailing guitars nicely complement the subject matter. The funky, slow opening drum (or bongo) beat of “Cannibals In Love” is occasionally backed by a and metallic-sounding guitar. Said guitar picks up a bit at times, but the overall feel is still slow. The drums ever-present throughout the song except during chorus, where the title is whispered. The interesting guitar use during the instrumental segment is also worthy of note. Despite what the name might make you think, is not an “obvious romance song parody.” It’s a serious tale of two cannibals stranded on a desert island whose lyrics discuss the inevitable um…”rationing” that must be done. The vocals ask what good are certain body parts if the singer can’t or won’t do certain things. For example, why keep a leg if you can’t leave the island anyway? Their haunting delivery will stick with you long after the song is over. In direct contrast to the above track, the surf opening of “These Horror Twins” features a fairly fast guitar backed by rapidly-hit drums and cymbals. Reverb comes into play a lot over the course of the song. Somehow, it still works ever when the singing comes in. Just as the song before it ends with them, “Night Vision Eye” starts with drums and cymbals, along with the occasional guitar strum. The singing style and some other elements of the song bring “Riders on the Storm” by the Doors to mind. The guitar use increases during the solo, but this is mainly a drum-driven song with the guitar acting as a spice of sorts. The rockin’ guitar opening and drum use of “Lucky Stiff” echoes the album’s opening track and also evokes the feel of a long road trip. The lyrics appropriately tell of a runaway who accidentally kills someone. Certain points are punctuated with guitar twangs. What starts as fast, medium volume guitar work becomes light and fast in background while drums and cymbals get the focus with the singer. It turns into the occasional riff and then goes back into full use (like the others) for ending. “Dead to Me” starts with light, medium guitar work coupled with some drum beats, and then gets slower when singer appears and sings of his “momma”. There’s a biker or “Kustom Kulture” feel to this song’s surf style, with the guitars building up during chorus and softening guitars (along with the drums) temporarily give way to singer alone. However, they return and build up to the reverb-heavy ending. “They Look So Good In Black” opens with what sounds like a sample followed by fast, heavy guitars and drums. The singing is somewhat more peppy and upbeat, as the song is sung from the point of view of is a proud agent who is more eager to do his dirty work (and torture). It’s apparently based on true stories of the Bulgarian secret police during the days of the Soviet Eastern Bloc. The subject matter is nicely reflected during a very rocking, fast guitar interlude with faint drum use and snatches of monitored conversations. “Nano Machines With Intent to Kill” opens with a heavy-sounding sound effect, then launches into cymbal strikes and light guitar use with the occasional drum strike. The guitar gets louder and more complicated; it’s vaguely “Wipe Out” like at points and mysterious and somewhat Middle Eastern sounding at others when it’s not doing its usual thing. Although it’s mostly an instrumental piece, there are some processed, echoing female vocals at times (presumably provided by Miss Frankie Stein). “Arsenal of Charm” is the slow dance track of album, but the guitars and percussion do rev up at times. The slow guitar opening features an occasional drumbeat, which then becomes a full drum use appears the singing starts. Although it gradually goes into an instrumental part, the singer returns and things go back to the way they were, save for occasional “oooh” that’s sung up to the ending. Although some might be put off by the changes in song styles on the album, I feel that it makes for a unique, pleasantly varied listening experience. Apparently others feel the same way, as the Mission Creeps’ ventures into various musical genres has led to them playing everywhere from film festivals to the eighth Tiki Oasis festival. So whether you want some great new music to get into or just want a twist on surf music, get into the Mission Creeps ASAP! Special thanks to The Mission Creeps for the review copy!